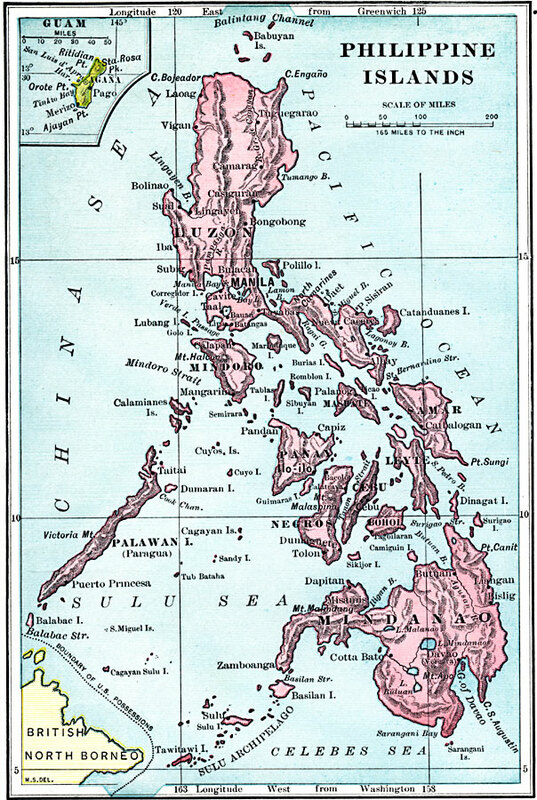 Description: A map from 1899 of the Philippine Islands. The Philippines at the time of this map had recently been taken as a possession of the United States under the Treaty of Paris at the end of the Spanish–American War (December 10, 1898), and the map shows the southwestern boundary of United States possession near the British controlled North Borneo. Major cities and ports, rivers, terrain, and coastal features of the island group are shown. An inset map details the Pacific island of Guam, also claimed as a possession by the Unites States under the Treaty of Paris. Longitudes from Greenwich are given at the top of the map, with longitudes from Washington at the bottom.